Environment Agency officers are out to crack down on illegal waste crime, kick-starting the ‘Right Waste Right Place’ initiative for 2017. One of the vehicles that was seized. Today (9 January), the Environment Agency led on a multi-agency day with the Driver and Vehicle Standards Agency (DVSA), Surrey Police, Commercial Vehicle Unit and Government Agency Intelligence Network (GAIN) in a bid to reduce and disrupt waste crime. This is a very busy time of the year for the waste industry as the excesses of Christmas can be seen in the sheer amount of waste produced. We see a surge of not only packaging waste but also unwanted electrical items and general household goods, which householders want to get rid of as part of their new year clean. We want to make it very clear to people that everyone has a duty of care to ensure their waste is managed and disposed of correctly by the people they give it to. If you use illegal waste carriers to take your rubbish you risk being fined up to £5,000. During the day, the DVSA stopped 6 vehicles and, together with officers from the various agencies, made checks to identify non-compliance. The operation targeted companies and individuals who transport waste without the proper authorisations. Environment officers also checked whether waste carriers were transporting waste to authorised and legitimate sites where it would be handled properly. Waste being transported with no authorisations is likely to end up at unregulated sites. Such sites store waste in vast quantities and for long periods of time, posing significant risks to health and the environment. One such risk is fire, which can lead to water and land contamination plus air pollution from smoke. Illegal waste sites are often the cause of odour complaints too. A couple of vehicles were seized as a result of the compliance checks undertaken. At the same time, environment officers visited a number of local industrial units in an intelligence-led operation. Here they made further checks and inspected documents to ensure waste was being dealt with legitimately. They found an unauthorised waste transfer station being operated by a skip company without any environmental permits in place. 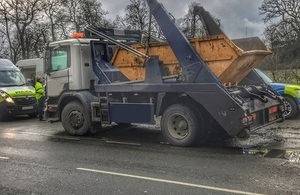 The Environment Agency wants to make sure businesses carrying waste have the proper authorisations to allow them to transport and transfer waste – a waste carrier’s registration from the Environment Agency and waste transfer note from the waste producer. People who manage waste illegally cost the taxpayer millions every year in clean-up costs. They also undercut legitimate business, and pose a direct threat to sustainable growth in the waste management sector. Our enforcement days make sure that the ‘right waste’ goes to the ‘right place’ ‎to stop unpermitted businesses undermining legitimate businesses and help create a level playing field. By working in partnership and sharing intelligence lawfully and efficiently, the GAIN aims to ensure that government agencies, along with police, help reduce serious and organised crime and protect the environment in the most cost-effective way. Today’s action is an excellent example of adopting a multi-agency approach. Find information on how to apply to be a waste carrier, broker or dealer. People or businesses who transport, buy, sell or dispose of waste, or arrange for someone else to do so, must be registered. To check if someone is registered use our quick check service. To apply for an environmental permit please complete the appropriate form.